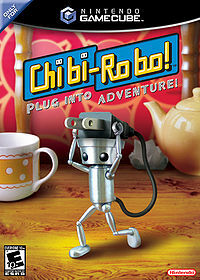 Boxart of Chibi-Robo: Plug Into Adventure! Chibi-Robo: Plug Into Adventure! was the debuting game of the Chibi-Robo series released for the Nintendo GameCube. "Say hello to Chibi-Robo! A pocket-sized robot programmed for adventure! Join him on his quest to spread happiness and SAVE THE WORLD! Chibi-Battery included." The game opens with Jenny making a wish and blowing out her birthday candles and getting gifts from her family. Her father Mr. Sanderson has also gotten a gift for her, which turns out to be a tiny robot known as a Chibi-Robo. Mrs. Sanderson is unhappy about this, for her husband is unemployed, but besides this, the mood is predominantly happy. Chibi-Robo starts helping around the house, receiving Moola, Happy Points, and other items, and eventually the whole family bonds with it. Soon enough, it learns about another, bigger robot in the house, known as Giga-Robo. However, this robot has been shut down due to taking up large amounts of energy. Chibi-Robo decides to help Giga-Robo by charging his battery to full power and sets off to find Giga-Robo's missing leg. One night Chibi-Robo walks into Jenny's room to find that she is mesmerized by the television. After viewing it, Chibi-Robo goes outside where he meets aliens who speak a language not understandable until Chibi-Robo gets the alien ear chip upgrade. The aliens tell Chibi-Robo about their friend who still has to grant his wish. But they eventually get sick because of the oxygen on Earth. Chibi-Robo later gets access to the time machine within their ship which it uses to go back in time. When he arrives he sees Giga-Robo and Mr. Sanderson arm wrestling. Mrs. Sanderson is watching from afar and their dog Tao is sitting on top of a silver case. After giving Tao a bone Chibi-Robo finds the combination to the case. This combination unlocks the case which holds the missing leg in the master bedroom. Chibi-Robo returns home in the present and finds the case and unlocks it. After obtaining the leg, spider-like creatures called Spydorz appear and come out of the case. Paying no mind, Chibi-Robo finally restores Giga-Robo to his former self and the shortly afterwards the Spydorz invade the house and the only way to deactivate them is by getting Mr. Sanderson's tool kit. After retrieving the tool kit the Chibi blaster is fully upgraded and the Spydorz queen ties the Sandersons up in a web. Chibi-Robo's only chance of the Sanderson's survival is to battle the Spydorz Queen. After defeating it, Giga-Robo gets his wish granted by the aliens to have an electric charge so it never needs to plug into a wall again. Chibi-Robo: Plug Into Adventure! is played in the perspective of the Chibi-Robo, who cleans up the house using various utensils. The analog stick on the controller is used for basic movement, from walking to climbing stairs and ladders. the start button is used to access a menu which splits into four different sections for stickers, options, items, and collected parts. Games developed by skip Ltd. This page was last edited on 21 August 2017, at 16:35.